Highfield House: 3 acres, pool, gym/games room, fire pit & grass tennis court. Highfield House is a secluded country residence just outside the popular Georgian market town of Holt, close to the beautiful North Norfolk coast. The house sits in three acres of grounds in which you can enjoy a heated outdoor pool (open mid-May to September), a game of tennis on the grass court (marked up, with net, in summer), a hidden valley and a fire pit to gather round. You can also hire a hot tub from our recommended supplier. For the younger ones there’s a football goal, playhouse and a wild beech maze to explore, as well as some outdoor games including croquet and lawn darts. The house itself welcomes you in with an impressive butterfly staircase, leading up to a galleried library area with a large collection of DVDs, books, games and a cosy sofa. It is surrounded by six large bedrooms which can sleep up to twelve people and accommodate a travel cot or two (one travel cot and five stair gates provided). All are light, bright and spacious; they have wonderful views as well. The super king-sized master suite has a sofa, dressing room and en-suite shower room. The East wing has a super king-sized bedroom with views of the countryside on three sides, a twin bedroom and family sized bathroom with separate bath and shower. In the West wing you can find another super-king bedroom, king-sized bedroom and double bedroom all serviced by a bathroom with bath and integral shower. All the super king-sized beds are 6ft zip and link so can also become 3ft twin beds, providing flexible sleeping arrangements. Downstairs there is a large lounge with oak flooring, comfy seating, open fireplace, upright piano and wide-screened TV, DVD player, CD player and Bluetooth speaker. Next door there is a snug with a sofa and desk, leading to a den with TV, DVD, Wii and a selection of toys for younger children. The dining room has a beautiful oak table and chairs for twelve (high chair available) and is next to a contemporary, fully-equipped kitchen with induction hob, double ovens, dishwasher, microwave, Nespresso coffee machine and American fridge-freezer (with ice and filtered water facility), with a kitchen table that seats six. There is also a gym/games room with a mirrored wall and a boarded exercise space with a treadmill, some exercise equipment, a full-size table-tennis table and dart board. There is a small utility room with a washing machine and drying rack, a guest toilet and cloakroom area. 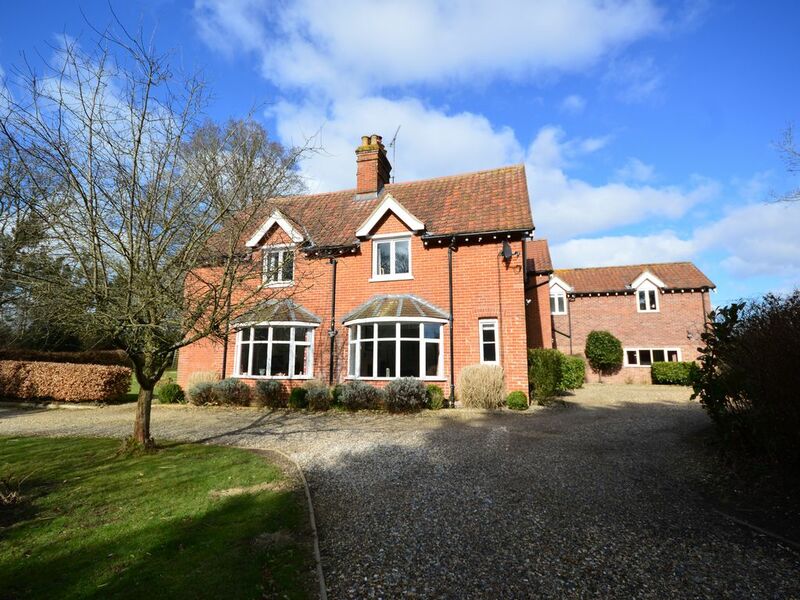 Highfield House is ideally situated, tucked away in its own perfectly secluded spot but a mere two miles from Holt. The town’s famous Byford’s Café and Bakers & Larner’s department store (with excellent deli) are well worth a visit, as are the wide selection of independent boutiques and gift stores, art galleries and antique shops, cafes and pubs, book shops and take-aways; there is a supermarket too. Only ten minutes away by car is the promenade in Sheringham and the spectacular cliffs at Weybourne. You can also go crabbing at picturesque Blakeney and enjoy more traditional seaside fun at Cromer where you can see the only surviving, full season, end of pier variety show in the world. In North Norfolk there is something for everyone, from walking to sailing, bird watching to adventure days out (zip wires, dinosaurs, treehouses), wildlife parks to golfing (mini or 18 holes), stately homes to cycling, seal watching to castles and museums. If you miss city life, Norwich is 26 miles away with excellent restaurants, theatres and shopping. From Norwich there are direct trains to London Liverpool Street, and the local Airport is a convenient worldwide gateway via Schiphol Airport. For an extensive list of things to do, what’s on and places to see, please have a look at the Visit Norfolk website. We look forward to welcoming you to Highfield House. Booking notes: You will have exclusive use of Highfield House and grounds when you stay. The minimum stay is 3 nights, with 10% off if you book for 7 nights. Please note that for most of the year we are happy for you to arrive on any day except Saturday or Sunday and our preference during the summer is for Monday or Friday arrivals but please do get in touch if you need more flexibility and we'll do our best to help. If you would like any other services, such as a hot tub or catering, please note that they will incur an extra charge and are for you to arrange directly with our recommended suppliers. Author and TV writer Carl Gorham is the current owner of Highfield House. Born in Brighton, he lived and worked for 25 years in London, starting as a stand-up comedy performer in the capital in the mid-1980s, then working as a sketch writer for BBC Radio before moving into TV and writing for people such as Hale and Pace, Tony Slattery and Maureen Lipman. He also created the animated sitcom “Stressed Eric” and co- wrote and produced the TV adaptation of "Meg and Mog", based on the best-selling children’s books. More recently, his memoir “The Owl at the Window”, won the Biography and Memoir prize at the East Anglian Book Awards. Emma Chamberlain, Carl’s partner, manages Highfield House. She is originally from Norfolk and was brought up in the county - her parents owned award winning country house hotel, Congham Hall, near King’s Lynn. She has worked in a variety of fields – private banking, education and online commerce. Her previous experience in the hospitality industry includes stints at Le Talbooth at Dedham in Essex and at The Savoy in London. Emma and Carl look forward to welcoming you and hope your stay at Highfield House is a happy, fulfilling and memorable one. Landline available for limited calls (charges will otherwise apply). International and service numbers blocked. Oil fired boiler with Nest thermostat. All bed linen is provided: bed sheets, pillowcases, duvet covers, throws/blankets. BEKO 8 kg 1400 Spin Washing Machine and clothes airer in utility room. There is an open fire in the main lounge. One basket of logs will be provided. Off road parking for 6 easily - can accommodate more with blocking others in. Unlimited Sky Broadband - however this is Norfolk so it not super fast. Boosters at some points around the house. Nearly 400 DVD's to choose from in case it's slow! Bath sheet, hand towel and flannel for each person. 1 hand towel in each bathroom/toilet. Please bring pool/beach towels. There is a treadmill in the gym/games room, a mirrored wall with boarded section (ideal for yoga etc) and a small selection of weights. Sky WiFi but not always super fast - it is Norfolk after all! We have nearly 400 DVDs for you to watch in case your movie is being slow to download. 24'x16' with open fire (fireguard available), sofas and armchair, 42" TV, DVD player, CD player, Bluetooth speaker and piano. Fully equipped kitchen with crockery, cutlery, glassware, cookware, bakeware, utensils, tea towels and oven gloves. Contemporary white kitchen. Nutribullet, hand blender, electronic scales and mixer in the kitchen. Beautiful solid oak dining table with light grey fabric, padded, oak legged Scandi-style chairs. Downlights, lamps and LED tealights all help to create a special dining atmosphere. 2 x 42" TVs (in main lounge and den) with Free sat channels. A 26" TV in the Hamilton Suite with free view. All with DVD players. CD player and separate Aukey Bluetooth speaker. 3 with nearly 400 DVDs for you to watch. A varied collection on the landing library area, next to a sofa. Full size table tennis table, dart board, treadmill, space for yoga etc. A selection of board games & puzzles for all ages in addition to a dart board and ping pong table in the games room. Selection of toys/colouring etc for younger children. A small collection of CD's with CD player and an Aukey Bluetooth speaker to use. 2 radios in bedrooms. A selection for younger children. Nearly 400 DVDs for you to watch - for all ages. Wii with Wii Sports and Wii Party to play - feel free to bring more games. 2 controllers, 1 nunchuk available. 3 acres with a fire pit & benches (basket of logs provided), a hidden valley, 6ft football goal, playhouse, beech maze, pool, grass tennis court, gardens/lawned areas, some outdoor games. Outside dining area (for the summer months) with seating for 12 up a couple of steps from the back/kitchen doors. Grass tennis court marked up, with net, in the summer. It's not up to Wimbledon standards but it's a lot of fun! Rackets and balls provided. All bedrooms are upstairs. There are 3 steps around the ground floor. The 2 internal kitchen doors are slightly lower than average. Open mid-May to September. Heated outdoor pool (approx. 30x15ft) running at 80-85F. Shallow end approx. 3ft deep leading down to a depth of 5ft 6in. Corner seat with jacuzzi water jets. Bring towels. Please see the Visit Norfolk website for all the local information.